Everyone wants to generate extra income. 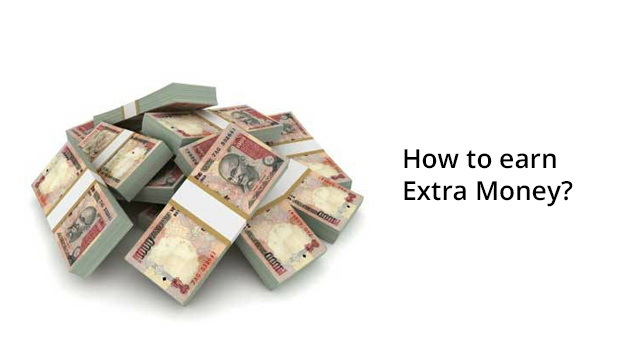 There are number of extra income sources which allow you to get some income legitimately and easily. This post has something for all. How often do you wish that you could have some extra income? You look for ways to earn money, extra money that is and it is perfectly fine. We are in an era where everyone wants something extra and more so in case of money. There is also a growing trend of people wanting to retire at 50 instead of 60 and in some case even 40 – 45. Blame it on the movies, inflation, changing cultures or globalization, but people have started to feel the importance of extra income and are constantly looking for ways to generate extra money. However, before we start please be aware of a lot of online scams and frauds. Let’s get started earning some extra money, shall we? We have been doing it for ages, our parents did it, and probably their parents did it too. So it’s nothing much to explain here I guess. If you need more returns get the FD in the name of your parents who are senior citizens, or look at these alternatives to bank FD here. Again pretty common, if you have shares of good and sound companies in substantial quantity, you would be receiving extra money in the form of dividend from them. Same goes for mutual funds. While taking a mutual fund there are 3 options (get details here) and if you are looking for some extra income, you can go for the Dividend Option. If you have existing mutual fund investments for over a year or even more, you can make this as an extra income source by starting a SWP or Systematic Withdrawal Plan. By this you can specify the amount of money you need your mutual fund house to deposit in your account either monthly, quarterly and so on. To understand it better you can have a look here and here. We all have some investments that we have made just because someone told us to. We don’t even know or remember when they mature or how much did you pay in premiums for it. They could be some mutual fund investment you made a few years back and forgot or a ULIP policy which is passed its minimum premium term, anything; just liquidate them, and invest in a Monthly Income Plan in mutual funds that can give you additional income or go for bank FDs if you wish. Yeah! One is too much to handle and at times people choose to go for part-time jobs just to compliment their income. Getting a part time job closer to your work place or closer to home can serve as a way to earn extra money, or freelance from home. If you have a job that requires you to work in shifts you can very well accommodate some part of the day to a part time job of your choice. If you have ancestral property you can very well put it up for rent and get a regular source of income. The most lucrative is a commercial property as it attracts higher rent. This is pretty obvious and in case you have funds to get a property in a developing area at lower prices, you can surely look to purchase it and put it on rent as a way to generate passive income. Also if you live in sprawling house, you can let one room to a paying guest for rent. You see those ads on television right? Buy, Sell anything. And that too for free. If you have an old digital camera lying around which is replaced by the ‘infinite’ megapixel camera of your latest smart phone, post it on these site and sell it. Anything you may find useless will find a buyer online. Just try it. The money may not be much, but then it is extra money. Do you love to dance, sing, paint, draw, teach, or anything that you can impart to others; use it. Before going to work or a couple of hours after work can be utilized to teach others what you know. The good part being, since it is a hobby, chances are you love what you are doing, and it turn that love is becoming your extra income source. This is a rather new trend for India, but is very popular abroad. You can sell domain names, server space, create websites, design something and put it up for sale online; the possibilities are endless. There are sites that allow you to upload your designs and if someone likes them they purchase it and you get a commission. Similarly if you have managed to purchase a domain name that may be in demand in the future, you could get some additional income through there as well. Recently an Indian real estate start-up purchased a ‘.com’ domain name from a person who had bought it a few years back for a few hundred dollars, for a whopping Half a Million Dollars. While you may not be that lucky, even a fraction of it may create some cash for you. Other option is Websites. If you can write on subjects that others may be interested in reading, you can create subject specific blogs or websites and generate traffic for it, and post ads which over time can serve your purpose of being a passive but an extra source of income. Also you can create a site that is aimed at affiliate marketing. Just use internet search to get started, all the help you need is out there. There are various companies and individuals who need content for their websites, blogs, product promotions, and what not. There are sites like skillpages, freelance writers, even the free classified sites, and a lot more, that have lots of such jobs. You can even take up proof reading, data entry work if you do not fancy creating some fresh content but can type reasonably well or have good command over English. However as mentioned above, beware of scams and frauds. If writing for a client, blog or website is not what interests you or you have some specialized knowledge that you wish to impart, just write it down. You can just compile your stuff into a PDF file or use any of the free online eBook making tools to make it into an eBook and sell it online or through various app-stores. If you keep at it and keep writing on various subjects, your sales may eventually pick up and result in more royalty thus proving to be an extra source of income. If you manage to find a publisher who can print your book and get on to the shelves of actual stores, that can be done too. Notice that a lot of cars carry vinyl posters over them. It is called car-wrapping or vehicle branding. If you spend a lot of time driving from one place to another and don’t mind your car looking like a small billboard, you can opt for car-wrapping. Approach your car dealer or an ad agency and they will point you in the right direction. The income can be quiet substantial and thus you earn extra money. You can find some more options to make money from very little to no investment over here. 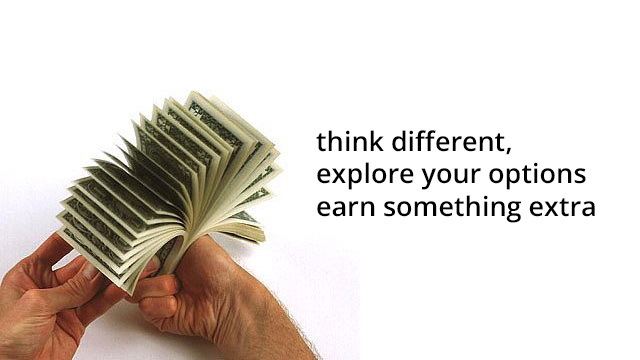 In today’s world where people are looking constantly for extra income sources, there a lot of options available too. You need to identify what suits you. Of course there are the traditional ways too as mentioned earlier in the post, but the newer unconventional ways aren’t bad either. Explore your options and you never know what started off as a simple extra income thing, may transform into full fledged income generator. Do you have any extra source of income that is off-beat and unconventional or do you follow the tried and tested ways of getting something extra? Post your views in the comments section. Hi sir, my age is 18running I have not much knowledge about share market but I want to invest in shares. Can you help me? Thanks for your interest and feedback. Being a personal finance portal our endeavor is to advice on ways to manage your finances better. We do not endorse websites per se. However there are popular sites like olx, quickr as free classifieds and sites like iwriter that pay for content writing. Blogging is an option too. As a general rule always be careful before choosing a website that claims to pay as some of them can be scams too. Always Google about their genuineness. Happy investing.